The Memorial Tournament presented by Nationwide hosted the sixth annual Legends Luncheon presented by Nationwide Wednesday, a unique, award-winning fundraiser that brings to life the alliance between the Nicklaus Children’s Health Care Foundation and Nationwide Children’s Hospital. All proceeds of the Legends Luncheon directly benefit the young patients and families that Nationwide Children’s Hospital compassionately serves each day. The goal of the Luncheon is to support advancement of research, medical equipment, and care in the areas of most need at Nationwide Children’s Hospital. To that end, this year’s Luncheon raised a record $1,100,000 for the Nicklaus Children’s Health Care Foundation and Nationwide Children’s Hospital alliance. The 2016 amount equals the largest single-year donation in the event’s history and brings the Luncheon’s six year total to $4,005,363.53. True to the hearts of Jack and Barbara Nicklaus, the Memorial Tournament presented by Nationwide includes as one of its primary objectives a genuine, philanthropic vision. It is through the Tournament’s partnership with Nationwide Children’s Hospital that this vision comes to life in the form of pediatric care for children in need throughout central Ohio. 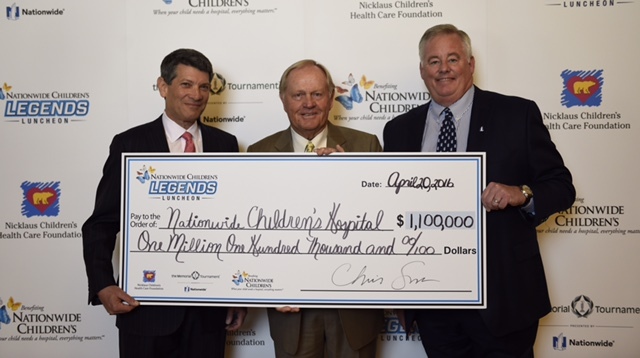 Six-year Tournament sponsor Nationwide shares a similar tradition of support for Nationwide Children’s. Nationwide is committed to broadening the impact of its presenting sponsorship of the Memorial Tournament to bring greater awareness and increased funding to Nationwide Children’s and to those who benefit the most – families and children in need of care. Hosts of Legends Luncheon presented by Nationwide were Jack and Barbara Nicklaus, together with Nationwide CEO Steve Rasmussen and his wife, Cindy, and Nationwide Children’s Hospital CEO, Dr. Steve Allen and his wife, Dr. Jamie Allen. Luncheon guests experienced a charity event that is unique to Columbus, Ohio. Held at the Ohio Union on the campus of The Ohio State University, guests enjoyed a special conversation with Memorial Tournament Host and Founder Jack Nicklaus and 2016 Memorial Tournament Honoree and World Golf Hall of Fame member Johnny Miller. The final highlight of the Legends Luncheon presented by Nationwide was the presentation of the “Nicklaus Youth Spirit Award,” which is given annually to a patient or family who in some way has demonstrated a strong, driving spirit in overcoming obstacles, an unwavering optimistic outlook, and a strong conviction for their connection to Nationwide Children’s Hospital. The Nicklaus Youth Spirit Award honors the courage within that inspires volunteerism and community outreach, which has a positive influence on others. This year Jack and Barbara Nicklaus presented the Nicklaus Youth Spirit Award to Nationwide Children’s Hospital patient Kyle Mitchell, 17, from Powell, Ohio. Being a teenager comes with its own set of difficulties, but just a few short months ago Kyle encountered an additional and life-threatening challenge. He was diagnosed with two very serious heart diseases—Wolff-Parkinson-White Syndrome and Hypertrophic Cardiomyopathy. Kyle underwent a successful surgery to implant a cardioverter-defibrillator and is doing well. However, as a result of his condition, Kyle is no longer able to participate in contact sports or any physically strenuous activities. He can play golf though, which just happens to be his favorite sport. The doctors at Nationwide Children’s took care to place Kyle’s cardioverter-defibrillator in such a way that he can comfortably play the sport he loves best. “I have used this major event in my life as motivation to accomplish the goals I have set forth,” Kyle said. “I wasn’t going to let this event get in the way of my dreams! Kyle is on the varsity golf team for his high school and enjoys boating, swimming, tubing, and hunting.